< Previous Vengeance is Mime! Next > Character of the Week: Headhunter! Finallly! You finally did a cyborg horse thingy! IT’S ONLY BEEN TWO YEARS!!! It took He-Man to force you into it. Alas, He-Man doth have his charms. Looking over this I am immediately reminded of the kelpie of the lore of northern United Kingdom (Scotland and Ireland… tho it may have origins in Scandanavian folklore… mayhaps it was intro’d to UK during/after the Battle of Hastings of 1066? Or perhaps during the frequent viking raids on Saxon holy men? This is my own speculation, however. The Irish and Scots have an immense history and folklore of their own originating to even prior, some would say, the Celts). For some reason (perhaps because the kelpie is often related to watery/marshy areas) I also associate this pic with the kappa of Japanese lore, though the kappa is often seen as a Toad Demon. I am also reminded of the Horse Demons from Chinese folklore (sorry, no link… I couldn’t find any nor do I know the name so I cannot look it up… again, apologies). You might also want to check out Apaosa. 3.) BACK-F’N-GROUND!!! Seriously, since it’s conjuring images of rich folklore, I say this one desperately needed something… horizon line, even a lone chiene-esque impressionistic willow would have done well. 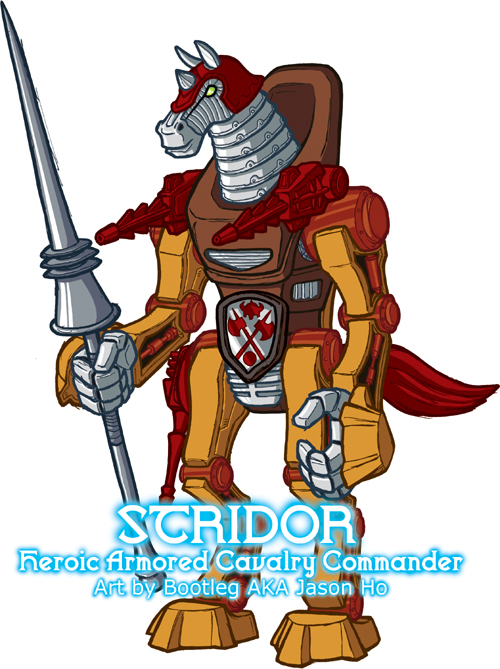 I look at this and I ask “I wonder what kind of world he exists in?” (Assuming Stridor is a he. Keep the BG simple. Silhouettes! You CAN’T tell me silhouettes are too time consuming! If so, tehn I’m making a general declaration/call for everyone who views these on a regular basis to CALL YOU OUT ON LACK OF BG EVERY SINGLE TIME!!! Come on man, a character is a product of its environment. Show the environment. It would take FAR LESS to scribble in some mountain-ish lines and color them purple with PhotoShop and than it took you to write up the background. 4) Background is good, tho it felt arbitrary and ancillary. A half-decent could have explained half the stuff in an instant. 6.) Now do a zombified version of him. Nice Stridor J-HO Pretty faithful to the O.G. but if you ever redesign 30 30, he better fly or something. Style is nice and clean as usual although the scratchines on the lance keeps catching my eye. I love the coloring though. As far as the Profile / History. Sir you have waaaay too much time on your hands my friend, probably not as much as Lord Shen but still. I do however like the bit about Man-at-arms adding this mode to make Stridor a more formidable combatant. So we gonna see a Knight Stalker (I think that’s the evil version right?) anytime soon? lordshen: ooh, i hadn’t heard of an apaosa before… thanks again for the detailed crit, man. i appreciate the time and thought put into it. i know backgrounds are something that i need to work on, but my he-man pics won’t be where i do that! the he-man stuff is all about just illustrating as many of the characters as possible. i hope that within a year or two my illustrations will cover the characters pretty comprehensively… and i won’t let backgrounds get in the way! the history is really just a gathering of my thoughts on the piece while i was working on it, and all in all its a retroactive explanation to justify the way i revised the character… ZOMBIES!!! You Rock buddy. This Stridor concept is really getting cool. Gtreat work. Nice redesign dude! Cool blog too! I’ll link ya! 2-bad: thanks, i appreciate it! andrew: thanks man, i linked your blog too!